I awake and peer out from under the tarp. To the East the valley is clear and we still have a clear view of the North wall of Rondslottet. To the West hangs a bank of low cloud. The scene a mirror image of the previous evening. I get myself moving. It had stayed dry in the night and so had I. Just a little condensation on the outer shell of my bag. Nothing that ten minutes in the breeze won’t solve. That is as long as the breeze isn’t carrying more wet with it. The plan for the day is to cross Ronslottet and Vinjeronden, perhaps also Storronden, before heading down to Rondvassbu for the last night. The last forecast before leaving Holland had promised great weather in the first days but a wet end to the trip. It had seemed unlikely that we would be subjected to more than one wet night so the idea of taking the minimum of shelter and using a hut to ensure the last night was a dry one had been tabled at the last minute. It had also been noted that DNT huts served beer. The early start we’d promised ourselves is taking shape. Each reeling off the now familiar routine and preparing for the off. It looks like we’ve made the right call and that conditions are good enough to have a stab at the high traverse but as we get about our business that wall of cloud in the Western end of the valley drifts eerily towards us. I stand and watch as it slowly floats along, ruler straight, until it swallows us up. Although the mist is thick it’s thankfully short lived carrying through as quickly as it arrived. Breakfast consumed and gear packed only the additional job of striking the tarps is left. Pegs are pulled, guys are neatly skeined, rain is shaken off and all is packed away. We’re on the move by eight. A quick scan of the map had told us that angling upwards on a line along the southern side of the valley would take us directly to the DNT path and save us having to loose height to find the intersection. But first comes a short boulder hop across the valley. 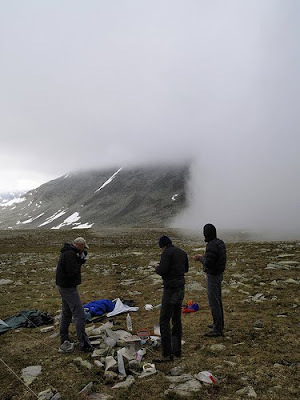 Having chosen the wettest valley in Rondane to overnight in, and then having decided to fill water bottles from the moving water of the Langluppbekken on the other side of the valley before starting the climb, we are surprised to find that water is hard to come by. The stream can be heard but not seen. Making it’s way deep down under the jumble of boulders. We have to back track some way before we we’re able to top up. Taking my lesson of day two on board I fill my two litre platypus to the brim. An extra kilo for the climb but I’m a long way through my food and besides water will certainly be scarce on top. We reach the DNT path and turn right to address the first job of the day. Just shy of eight hundred meters straight up. Based on what I’d read we’d be on one continuous boulder field from top to bottom. I find my rhythm quickly. 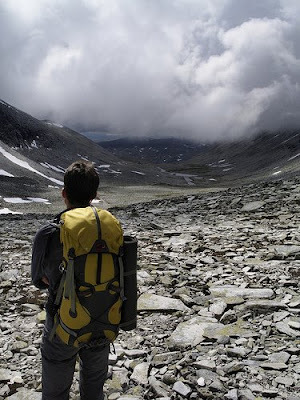 My rucksack carries much better than on the first days when my load had been at it’s heaviest. The hip belt is now doing the work and, my shoulders free, I am better able to find my balance. Or perhaps, with all the practice of the last days, I’m just getting better at boulder hopping? The conditions definitely suit me better though. The sun still shines strongly but now intermittently. Drifting cloud providing periods of shadow and time to cool off. It’s a hard climb, but the view back into the valley provides entrainment enough in the short pauses. The changing cloud patterns providing extra interest and inviting me to look through the lens of my camera at every turn. The upright stones embellished with a bright red letter T which serve as way markers on the DNT paths provide targets for each burst of effort and reassurance that we are heading in the right direction. Not that navigation on this stretch would be hard without them. The contours say that up is always good. Down, on the other hand, is bad. Down to the right certain death without a parachute, down to the left a good deal steeper than you’d take on without the need to feed an adrenaline addiction and really good insurance cover. Navigation largely taken care of by the DNT, the forecast for rain in the afternoon brings with it an extra concern. 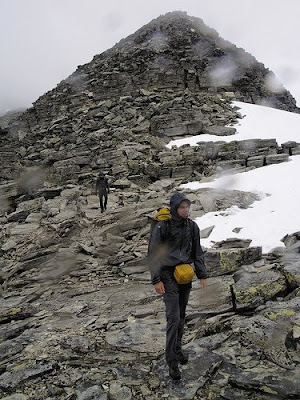 We plan to be at the second summit, Vinjeronden, before things get ugly and to avoid having to do the worst of the scrambles in the clag on wet rock. I keep checking my watch and gauging our position as best as possible managing to get a good fix on our position as the path closes on the North wall, a gaping gully opening up, reflected as clear as day in the contour detail of the Turkart. Willem-Maartens altimeter is spot on. As near as damn it 1960m. Just over 200m to go and clearly we’re now covering ground at a respectable rate. No longer off the bottom of Tranters scale. I’m better at up than down. I think that the group also climbs better than it descends. 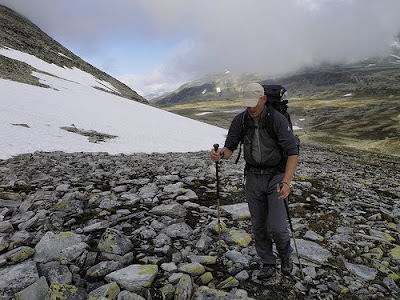 Before I’d left for Rondane, Roger, of Nielsen Brown Outdoors fame, had recounted his traverse of Rondslottet. 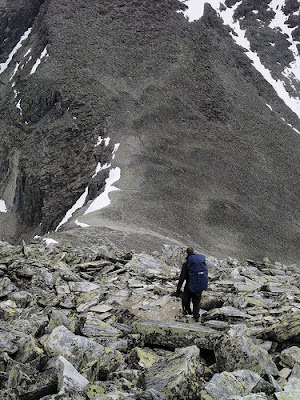 He’d done it in the opposite direction, taking eight hours for the full traverse, finding the climb enjoyable but the descent into Langluppdalen over boulder tough. His words go through my head on more than one occasion and serve to make me thankful that events had lead us to start out from the North. Thankful for the moment that is. Perhaps Rogers enjoyable ascent would turn out to be gnarly in reverse? The last two hundred odd meters pass quickly enough, just a couple of snow fields, complete with man traps, have to be crossed but prove crossable with care. Funny things summits. Sometimes they play hard to get. How often does it happen that, just as you think you’re on the final rise, you reach the top of the incline only to find that the summit has run away and is pulling tongues whilst singing na na na na na and leaving you with another stiff climb? Rondslottet it appears is of the other variety and just jumps out and says boo when you’re looking the other way. 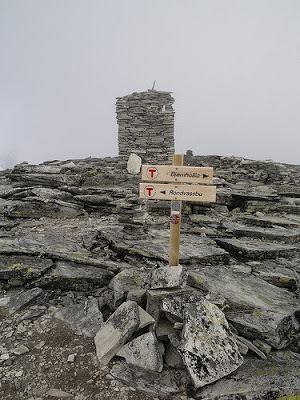 The summit of Ronslottet is a wondrous place. 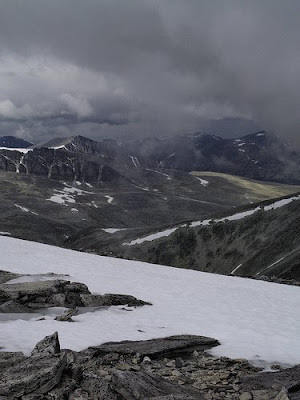 At this, the highest point in Rondane, an otherwise wonderful stretch of wild country, is more evidence of human intervention than in the rest of the park put together, the areas around the huts excluded. After hours of boulder we’re greeted by a relatively tidy arrangement; big cairn, sign posts and numerous walled shelters, the interiors of which are clear of boulders. It strikes me that it would all make for a more than comfortable summit bivvy. It also strikes me that you can better get there early to bag some space. We’ve seen in total, in three days, and thirty something kilometres, around twelve people. Only two have been close enough to exchange words. It’s clear that a fair proportion of the humanity that drifts through this place converges on the few square meters of this summit. It’s cold enough to require down jackets and woolly hats when at rest. Wrapped up in extra layers we sit at the foot of the cairn and wait for a pan of water to boil. The view over the North wall, and in all other directions, being obscured by cloud takes the attraction out of a circuit of the summit but a cup of hot stock seems like a good compensation. Besides, there’s something strangely enjoyable about sitting on a cold mountaintop in the swirling mist. After three days of uncannily good weather and long views I at last feel like I’m in familiar territory. Mountains, complete with real mountain weather. There’s no mistaking where we are. It’s a good opportunity for the group photo and Willem-Maarten does the honours with the self timer. As the water just starts off on a rolling boil the burner sputters and wheezes and the last gasp of gas burns blue and the flame dies. The antique canister has delivered two main meals and a couple of brews. I guess two such canisters would have got us round. Still, we’ve done the decent thing and cleaned up the old stock and whoever next comes through Mysuseter expecting to find gas will find a well stocked shelf. Three stock cubes go into the water, one chicken, one beef and one lamb, something to please everyone, and the salty liquid goes down a treat. Even more so because Thim has conjured up yet another rookworst. It’s early but nevertheless I work my way through what’s left of my rye bread and pate and trust that what remains of my trail mix will see me over the next summit and down the other side. It’s looking like I’ve judged things just right. I’ve got breakfast for the morning and a few hundred grams of trail mix. Arguably a little more room for error would have been warranted but I won’t go hungry and I won’t be packing out much by way of unused food. As we wallow in the afterglow of a hot drink on a cold mountain it starts to rain. Sleet to be precise. This isn’t according to the contract. It isn’t supposed to rain until later in the afternoon when are safely on our way back down to earth. In unison we get about stuffing down jackets safely into packs and pulling on rain shells. That horrible moment, the one when you’ve taken off your warm layers but have not yet got up enough steam to drive off the cold, passes quickly and before I realise it we’re making our way down the initially shallow slope. I guess this next bit could require some careful navigation so I pull out a set of A5 maps I’d printed off for just such an occasion and string the little Ortlieb map case around my neck. 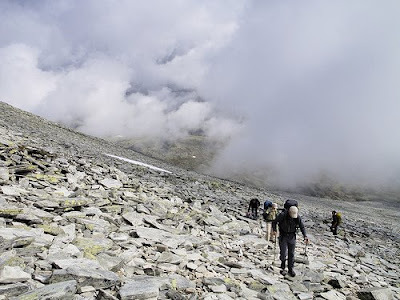 My fear is that, in the mist, we’ll miss the right line of descent to the saddle that stands between us and Vinjeronden. The contour details suggest that this is something you really don’t want to do. Although I keep in touch with the map it turns out not to be necessary, the marker stones are spaced closely enough to be visible under such conditions and, use tracks run across the stretches free of boulder. The route weaves back and forward through a lunar landscape of snow and rock but we find ourselves on the steep descent soon enough. Very steep in fact. 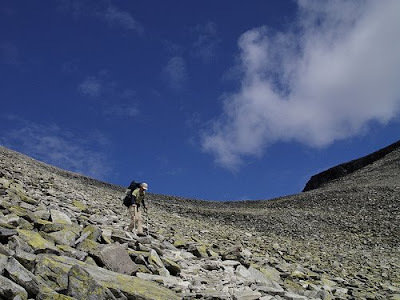 However, we are back on one those Rondane staircases and although Rondane stone is indeed slippery when wet, with hands and feet the descent is doable, enjoyable even. We have to drop just 200m to the saddle and I find myself looking back up the ridge after what seems like just a few minutes. Viewed from the bottom the ridge is intimidating, draped half in cloud, steep and long, a chaotic jumble of rock. I think back to that first glimpse of the western face of Steet on the Smiubelgin ridge. How I’d sucked in my breath and concluded that there was no way up the thing. That I was looking at the baddest of bad steps. 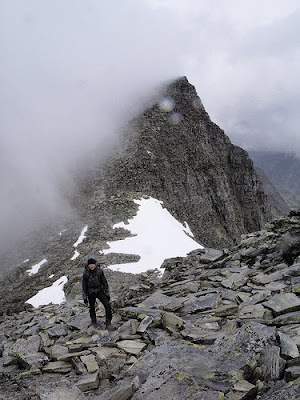 Was it not for the fact that this traverse is waymarked and described in Scandinavian Mountains I might have had the same feeling about this ridge. A mix of vantage point and prior knowledge makes all the difference it seems. Not for the first time I make a promise to use guidebooks when planning. Sure, I like nothing better than to spend an evening pouring over a map, interpreting the topography and planning my own routes but it wouldn’t hurt to listen to what others who’ve been before me have to say. I take a couple of photo’s of the ridge as the lads descend. They look okay on the screen but I can’t catch the full drama of the thing, it somehow looks lower and broader than in real life, the wide angle end of my zoom foreshortening the feature. I guess it would be better to put some distance between myself and the ridge and use some zoom but there’s not enough room to do it. A few strides further and the climb back up the other side starts. More boulder, more steep but only a couple of hundred meters and then the top of Vinjeronden. Our fifth top but only our third above 2000m. We might have bagged twice as many or more had the first day worked out differently. Still, as Ronald Turnbull advocates, it’s a good policy to save a few for later. As we make the top the weather starts to clear and we are treated to long views once again. Veslesmeden, the one that got away, looks back with a rye smile. Can we still be so close to where we started? Storronden, the one we might still do glowers at us from beyond the next col. The col itself sandwiched impressively between the hanging Ronhollet and the Storbotn corrie. The corrie, sketched in plan view, just one step to the North but five hundred vertical meters below. This is what I came for. We languish a little on the top and then, cautiously, make our way over the edge. The slope, at first invisible over the convexity of the edge, reveals itself as we descend the first few meters. This decent holds no surprises. It’s all laid out in front of us. Just shy of 300m, not as steep as the last one, but still on boulder all the way. I take my time, taking photo’s of the group descending ahead of me, contemplating Storronden and the climb we might do to bag another 2000m top. Part way down I strip back down to my base layer. I’ve been lazy and left it too late to remove layers and my base layer is wet and, despite the blue skies and warm sun, cold in the breeze. I pull on my windshirt and move along. I pass a couple on the way up. It seems to me that they’ve made a late start if they intend to get over Rondslottet and further, but then I remember that it doesn’t really get dark. By now I’m a long way behind the others. Willem-Maarten is already approaching the flat of the saddle. He’s consistently and significantly faster than the rest of the group. Sure footed over rough ground and, although he estimates himself to be less fit than in previous years, I guess he’s still much fitter than the rest. I wonder if he will ever get fed up of hanging around on saddles and summits waiting for us to catch up? Then again, if you’re going to do some hanging around then why not do it on a saddle or a summit? The next time I look he’s chatting to two people who’ve just reached the saddle out of the Rondhollet valley. At least he’s got company. A little way further and I pass Willem-Maartens newest acquaintances. A man and his young son heading up to the top on an out and back from Rondvassbu. Know that I have kids I realise just how special this is. I assure them that I’m the last in the group and that they’ll now have the mountain to themselves. I arrive at the col and the group doesn’t miss the opportunity for one last deep discussion about what to do next. I find straight down into Rondholet an attractive idea. I feel we’ve done enough for today. We certainly will have done by the time we make Rondvassbu another 500m below over who knows what sort of terrain. I voice the thought but as I hear the words come out of my mouth I already feel a pang of regret. Storronden is within reach, not without effort, but definitely within reach. At once I feel a mixture of conflicting emotion, the idea of going on and making a big day bigger appeals. Take on the challenge! Be a man! However, my guess is, that the additional 800m of descent, quite steep, over the broad western ridge will take all of the pleasure out of the achievement. It surprises me but the idea of arriving in the valley, tiered but not broken for a change also holds and attraction. Then there’s that beer we talked about. Why did we do that? Who mentioned it first? That should be against the rules! My minds made up. Probably. I think. Willem-Maarten says he feels he’s got another top in him and clearly wants to go for it. Thim is in two minds but I think he’ll go for it given an excuse. Theo and Jef are ready to make their way down. Perhaps they know themselves better than we do? Willem-Maartens comment gets those emotions all rolling around in my gut again but now with an added twist of guilt added for good measure. If I don’t go then I’m holding Willem-Maarten back. I fight down the emotion. I’m for heading down. Probably. I think. After a few minutes lazily taking in the view, Storbotn no less impressive when separated by just 200 vertical meters, and chewing on snacks we shoulder packs and move off. Downwards. Do I really want to do this? Every step down is an extra step back up and there comes a point when all that head wrestling becomes pointless. When you’ve added another fifty, hundred, hundred and fifty meters of back up it no longer makes sense to turn back. Storronden is duly put back in the vault for safe keeping. Descending the boulder filled slope into the head of the lovely Rondhollet I can feel my thighs burning and I know I’ve made the right choice, the sensible choice, but there’s still a tangible feeling of regret hovering in the background. The Rondholet is a beautiful valley and the steep descent from the col out of the way a pleasant walk. We make our way down the valley at a leisurely pace, soaking up the surroundings, each, I think, coming to terms with the fact that the trip is drawing to a close. I ask Willem-Maarten if he’s disappointed we didn’t continue over Storronden. He seems okay about it. It occurs to us that our first bivvy would have been in this valley had we not have elected to do the trip in reverse and as we move down the valley we comment on possible sites. A little way down we find the site of all sites. An island, large, flat and grassy, framed by a split in the Rondholbekken. Fresh running water and a soft bed with a great view. What more could you want. We decide to take another short break and jump the near branch of the stream flopping out on the island. Do we really want to spend the night in a hut? We still have an unused evening meal and enough meths to prepare it. If we get a reasonably early start we can still catch the bus from the spranghaugen car park. The traditional discussion ensues. What about mosquitoes, we must surely be deep in enemy territory, just look at all the green. What about that beer? It’s just down there. Too far to fetch and bring back but still only just a little way further. I surprise myself again. On the way down the valley I’ve been processing the idea that the trip is drawing to a close and I’ve got used to the idea and whilst this site is a corker I don’t fancy sleeping in a buzzing cloud of angry mosquitoes. Besides, right now, there’s no discernable difference in smell between my armpit and my boot and the opportunity to have a shower before returning to civilisation would be welcome. God help the poor people who share my train carriage if I don’t. The deal is done. As we drop down the last stretch of the path to Rondvassbu we pass two Norwegian lads heading up. They’ve made an even later start than the others we’d passed earlier. Presumably they’d come straight from spranghaugen having caught the afternoon bus. They were sweating under their loads, stooping forwards to counterbalance litres of gear in big, bombproof, Bergan packs. One of them has a fishing rod strapped to the outside of his pack. An image of myself, twenty odd years earlier, when gear was too precious to leave at home and the whole point of the exercise was succeeding inspite of the load on my back. They stop for a chat. They intend to head up Storronden and later to continue over Rondslottet. I wonder what they mean by later but don’t enquire. As we make our way down the steep bank into the hut complex my legs tell me that the game is over . Willem-Maarten returns the favour and asks if I was disappointed that we had decided not to bivvy. I reply that I’m looking foreward to a shower, a beer, a good meal and a night in a bed and that, if anything, I’m disappointed in myself for finding all that such an attractive proposition. The shower is great, the meal better and the beer the best of all. Worth walking half way round Rondane for. I sleep almost as well in the bed as I had done in the Langholet corrie. Brilliant report and photos Dave. Really took me out into the mountains. 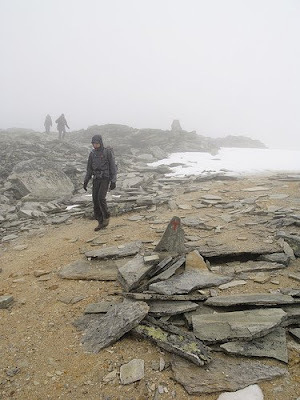 As for those summits that always seem to be over the next ridge or around the next corner, they definitely out-number the ones that suddenly appear! As great as it is to walk under sunny skies I find that photos gain an extra dimension with the addition of some cloud. It is a rugged and wild landscape. Thanks for all the effort in writing the walk up and sharing it with us. Stunning photos and it inspires me to want to one day go there. Holdfast: Yes I have to say, blue skies and blazing sun was nice for a change but I felt much more at home with the weather on that last big day. Besides, It gave me an excuse to try out the Haglofs Oz in some proper weather. As you say a bit of drama in the sky looks nice on the photos. Martin: It's my pleasure. I realy have a lot of fun reliving the trip but I have to say the positive response from people like yourself makes it even more rewarding. Norway, Scandinavia realy, is a very special place that excercises a strong pull on me. I think it's the last place in europe where you can still experience something like true wilderness, especialy in the North. It's certainly provided me with my best trips. better and wilder than North America even. Rondane has quite some infrastructure but in the heart of the area there's some realy fine wild country. Memories of the Langholet valley will stay with me for some time to come!I realy hope you get a chance to enjoy it yourself some day. Stunning photos as usual, Dave. When I got to the top of Rondanslottet in the blazing sun there were many hikers on top and what surprised me at the time was the number of female hikers taking advantage of the brilliant sunshine to enhance their suntans. The views of the surrounding peaks was fantastic. 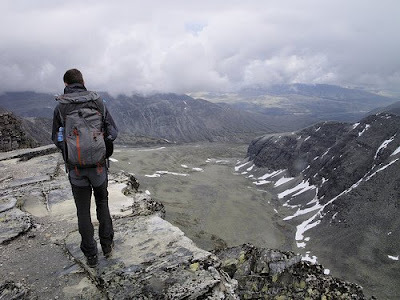 Well done on a wonderful write up Dave, I will continue keep coming back to this and will no doubt be necessary reading should I ever plan a another trip to Rondane. Roger, We were lucky. We had the top to ourselves (early in the season I guess). We didn't get the views you did but I guess you can't have everything and we did get good views from Vinjeronden with its spectacular situation above storbotn so you won't hear me complaining. Glad you enjoyed the write up and photos. Likewise, I'll miss the regular instalments over the Jotunheimen and the Hardangervidde. It's been a real celebration of Norway these last weeks and it's been fun. great pictures of a really mountainous and rocky place. No chance of mistaking this for the UK ! Dave: Actualy I'm always quite surprised by how well the UK prepares you for this stuff. There's not much you'll come across in Rondane that the Cairngorms or the western highlands doesn't have to offer. Just bigger and more.